In a year that seems to be all about recognising the best of British, here’s one celebration of home-grown talent that I can get behind. Heritage horsey jacket -makers, Lavenham, have teamed up with everyone’s favourite London design duo, Eley Kishimoto, for a timely re-imagining of the classic quilted jacket. The classic flash logo – which has adorned everything from beer glasses to wallpaper (I KNOW!) – will be making a special guest appearance on Lavenham jackets and bags as part of a limited edition range this October. You can be as flash-happy as you like, with a Raydon jacket completely covered in the print or just discretely tucked away in the hood and lining. 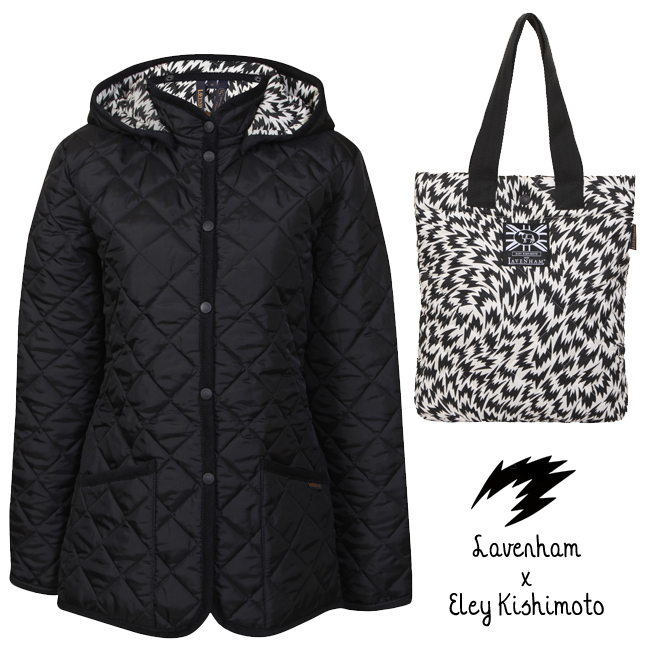 There’s also a gilet, shopper and children’s jacket, all featuring that signature black and white print combined with Lavenham’s classic equestrian-inspired pieces. The range will be available in October from www.lavenhamjackets.com – which is a shame, as this weather is kind of calling for a stylish waterproof.